This triangle honors William F. Moore (1897–1918), a Marine private killed in battle during World War I (1914-1918). A graduate of PS 17, Moore grew up nearby on the corner of 103rd Street and Corona Avenue. Moore enlisted in the Marine Corps in April 1917 and was killed in 1918 while serving with the 47th Company, Fifth Regiment at Belleau Wood in France, in one of the bloodiest engagements fought by the United States during the war. A flagstaff base marking a recent renovation commemorates Moore and his valiant sacrifice. The history of Corona ties intimately to the arrival of the Long Island Rail Road in 1854. When speculators from Manhattan began developing the settlement that year, they planned the streets in accordance with the railroad route. The tiny village was called West Flushing in remembrance of the Flushing Remonstrance, a landmark document drafted by Quakers 200 years earlier that called for religious freedom in America. The town grew quickly in population, and in 1872, the village decided upon a name it could claim as its own. Corona, a Latin term for “crown,” was chosen because the town’s settlers considered their home the corona of all Long Island municipalities. This triangle, on the corner of 108th Street and 51st Avenue, was mapped as parkland in 1922 and acquired by the City by condemnation in 1924. A tablet by sculptor James S.J. Novelli commemorates 49 local residents who died in World War I. The tablet, donated by the Corona Heights Civic Association, was dedicated in 1929. Originally known as Corona Heights Triangle, in October 1929 it was renamed to commemorate Moore, reported to be the first neighborhood soldier killed in the war. After 1929 a 40-foot strip of land along 51st Avenue was pared down as part of the widening of the street. The southern tip of the park commemorates Joseph Lisa, Sr. (1898–1977), who was the Democratic District Leader from Corona from 1950 to 1976. A tree and tablet were placed in the park to honor his work in the community. 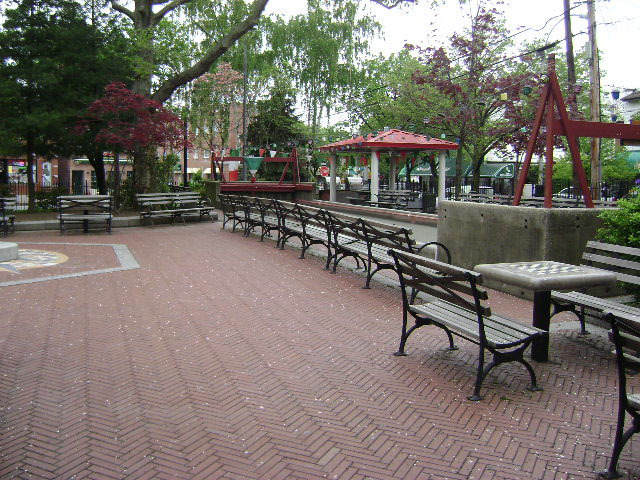 In 1980 the park was renovated and lights were added, which helped reestablish the birch- and maple-filled park as the nerve center for the neighborhood. Today visitors to the park play bocce, cards, and enjoy Italian ices from the renowned Lemon Ice King of Corona, located nearby.